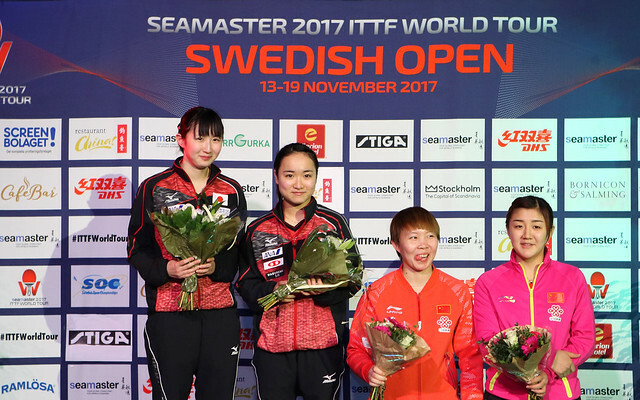 There were shocks aplenty on the second day of qualifying ahead of the Seamaster 2017 ITTF World Tour Swedish Open in Stockholm as a fair number of the top ranked players competing in the group stages suffered early exits on Tuesday 14th November. Two qualifying matches in and Russia’s expert defender Polina Mikhailova was well placed to progress from Group 28 in the Women’s Singles qualification group stage, but it was Spain’s Maria Xiao who led the standings heading into the final round of group stage fixtures with a stronger games ratio. Polina Mikhailova’s fate was still in her own hands and required just one more victory to seal top spot in the group, however, the world no.67 lost out to the world no.89 across six games (4-11, 8-11, 5-11, 11-9, 11-5, 9-11) as Maria Xiao booked her spot in the preliminary play-off round. Another surprise exit came in Group 13 as Japanese star Maki Shiomi was eliminated from the competition at the hands of Marie Migot. French contestant Marie Migot, who occupies 226th position in the world rankings table, made a strong start to the qualification tournament by registering an opening win against Hong Kong’s Mak Tze Wing and was impressive yet again in her second encounter, storming to a terrific 4-2 victory over world no.41 Maki Shiomi (11-4, 6-11, 11-4, 11-5, 7-11, 14-12). Shock exits for two major players competing in the group stage and almost adding her names to the list was former European champion Hu Melek, with the Turkish representative edging through to the next qualifying round courtesy of a tight seven games win against Polish opponent Magdalena Sikorska (12-10, 9-11, 7-11, 11-1, 9-11, 11-1, 11-6) who, despite a brave showing, finished third in the group. Tom Jarvis has earned a place in the second preliminary round of the Men’s Singles event following a fantastic effort in his concluding group stage match. The young England star who currently sits at no.348 in the standings caused a major upset in Group 12, prevailing over world no.46 Gao Ning (13-11, 11-9, 12-10, 8-11, 11-3) while fellow Englishman Andrew Baggaley also topped his group courtesy of a magnificent outing against Sweden’s Anton Källberg (9-11, 11-8, 11-5, 11-7, 12-10). Disappointment for Anton Källberg, but opposite emotions were experienced by fellow compatriots Simon Berglund and Jens Lundqvist. Victory by the narrowest of margins for Simon Berglund condemned Germany’s Ricardo Walther to an early exit in Group 9 (11-7, 8-11, 11-7, 9-11, 11-6, 9-11, 15-13) and over in Group 46 Jens Lundqvist claimed his second consecutive straight games win as Tonin Ryuzaki of Japan failed to progress (13-11, 11-9, 11-8, 11-3).